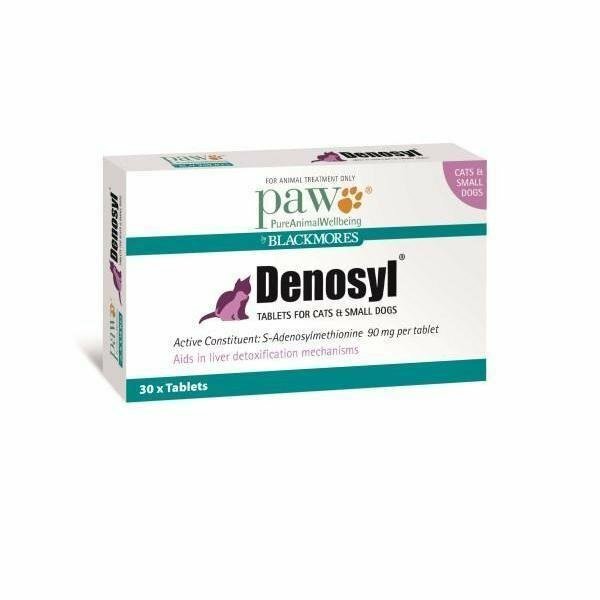 PAW Denosyl Cats & Small Dogs 90mg x 30 Tablets contains S-adenosylmethionine (SAMe), which aids in liver detoxification mechanisms in dogs and cats. The liver is one of the largest organs in the body and performs many life-essential functions. It produces a vast number of hormones, enzymes, proteins, and other substances important for your pet’s life and well-being. It also detoxifies and removes waste products in the bloodstream by changing them to a form that can be eliminated. This filtering of waste products is important because toxins can damage the membranes of cells in the liver and other organs. The most important liver “detoxifier” is glutathione, a potent antioxidant and the liver’s first line of defense. Contains the active ingredient S-adenosylmethionine (SAMe) in an enteric coated tablet. In cats, tablets or capsules can “stick” in the throat instead of passing into the stomach. Therefore, cat owners should gently administer a small amount of water (ask your veterinarian for details) immediately following tablet administration to aid swallowing. Denosyl® tablets should not be broken as the enteric coating of the Denosyl® tablet protects the active ingredient from destruction while in the stomach. The number of tablets can be gradually reduced or increased at any time depending on the pet's needs. When increasing or decreasing the dose, adjustments should be done in full tablet increments. Center SA. Proceedings of the 18th ACVIM, Seattle, WA, 2000; 550-552. Center SA. Proceedings of TNAVC, Orlando, FL 2001; 218-219. Center SA, Warner K, Hoffman WE, et al. Am J Vet Res 2005;66(2):330-341. Webster CRL, Boria P, Usechak P, Anwer MS. Vet Therapeutics 2002;3(4):474-484. Center SA, Warner KL, Erb HN. Am J Vet Res 2002;63(8):1187-1197.